It is not just food, how much calories you burn doing sports or walking but also what to drink to be fit when traveling that is important. 1. I have to say what you know already – water remains the most important drink even when you are traveling. Some people never drink tap water and spend money on bottled water no matter in which country they are. But I try to do both things as there is chlorine in tap water which is not good for you but on the other hand plastic bottles get chemicals into the water you drink then and you don’t want this. The best way to start your day is drinking warm water with lemon which will boost your metabolism. It used to make me sick even when I thought of it but now even in restaurants/bars I tend to ask for still water and lemon. Or when I get lemon/lime with my food, I squeeze it in in my glass with water. Also remember what some studies say: sparkling water and some other fizzy drinks containing also phosphorous can remove Calcium from your bones, so go for still drinks instead just to be sure. 2. Tea – I am a sucker for tea and when I travel it is very difficult for me to spend even a day without any cup of tea. It is not the best thing for your white teeth (you can drink it through a straw to avoid teeth colouring) but does help many other things. 3. Fresh juice – no, I don’t mean to drink juices bought in groceries as they contain a lot of sugar and I have read about some studies in the past few years saying they can increase the number of cancer cells. Fresh juice is made from fresh fruit/vegetables and squeezed just before drinking. In many countries you can easily get cheap fresh juice at the street, in stalls inside the shopping malls and also in restaurants. You can even drink fresh juice or smoothies with no added sugar instead of snack in between big meals and count them into 5 times you should eat per day. 4. 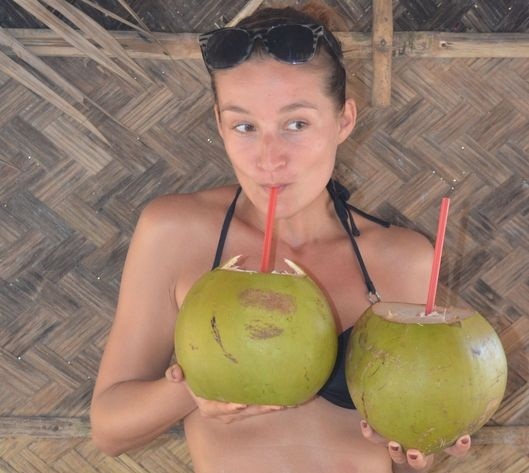 Coconut water – When visiting some countries, such as Thailand, Mexico, Philippines just to name a few, you should drink fresh coconut water every day. When I am there, I spend up to a few euros for coconut water every day as it is hard to get in Europe. Coconut water contains B and C vitamin, potassium, minerals, it fights against diarrhea and cancer, it is anti-ageing, helps digestion and it makes your skin look fresh among other benefits. 5. Avoid alcoholic beverages – apart from the fact that most of them have many unhealthy qualities, they also contain a huge amount of sugar, unnatural flavours, colourings etc. I quit drinking alcohol on the 1st January 2009 and never got back to it ever since. 6. Avoid sodas – you will never see me drinking a cola or any other fizzy soda drink. They have so much sugar your body does not need and happily saves it on your belly. There are girls who asks me how I keep my good figure when traveling and they ask me this while they are drinking a cola and me with my healthy water or green tea?! 7. Avoid energy drinks – no, you really don’t need them nor their sugars and they also have a very bad effect on your heart. I remember each time I had a very difficult exam at the University and drank an energy drink before it to keep awake, my heart started beating fast like hell! Next time try to drink what I recommended in the first 4 points and avoid the other 3 drinks. You will be surprised about the difference. Do you have any other tips what to drink to stay fit when traveling? I love this list! Currently in Hawaii Big Island and trying to make a healthy working vacation of it all. Agree about the WATER! Thanks for this post! Great list of healthy drinks. Wow, this is amazing! I know that I always get a nicer skin and I feel fresh when drinking coconut water and I also use 100% coconut oil instead of a body lotion. Great list. Already loving coconut water and tea! Not so big on the fruit juices, although it is nice when in the caribbean – they are so fresh! Love when they juice it right before your eyes! To stay fit is very important especially if you are planning to travel. You have done your best with writing this article, also the attention about what to avoid when going to travel. Keep up the good job!